Why CSE at Michigan? It's THE Place for Computing. Come to Michigan and experience programs in computer science, data science, and computer engineering that provide interdisciplinary and teamwork opportunities, technical rigor, enormous opportunity for impact, and which arm you for lifelong growth. Founded by computing pioneer Arthur Burks in 1957, the Computer Science and Engineering Division at Michigan is one of the oldest and most respected in the world. Our students enjoy the advantages that come from engaging with a progressive curriculum, internationally-recognized faculty, and an intellectual community that values diversity, interdisciplinary teamwork, entrepreneurial thinking, and inventiveness. Research in CSE is highly impactful and interdisciplinary. explore connections to music, medicine, economics, transportation, the environment, and more. Michigan students in computer science and engineering enjoy the benefits that come from engaging with the broad and rich culture of the University, which is rated one of the world's top institutions and is home to 19 schools and colleges. Because computer science and computer engineering have become universal elements that touch virtually every other discipline, the diverse U-M environment fires the imagination and reveals opportunities for collaboration and impact. 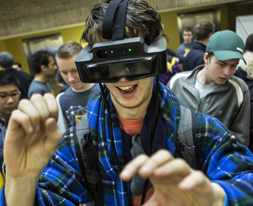 Students experiment with technologly at coding and hack events throughout the year. For those interested in research outside of the classroom, undergraduate students have the opportunity to engage in a variety of research programs that will enrich their experience during their time of study at Michigan. Graduate students explore new frontiers and work with highly esteemed faculty in state-of-the-art facilities. Entrepreneurship at the University of Michigan has exploded over the past decade, and a network of resources and programs exists to support the ingenuity and entrepreneurial actions of our students, many of which are available to our student through the Center for Entrepreneurship. Computer science and engineering students are well-positioned to engage in entrepreneurial success because of our discipline's pervasiveness and the minimal structural barriers to developing product in CSE. Our students take entrepreneurship and inventiveness into their own hands through many student-run workshops, coding sessions, and hackathons. The Solar Car and other competitive teams rely on computer science, data science, and computer engineering. 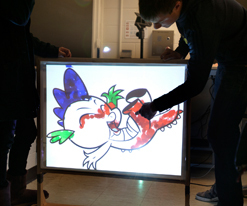 Our students have the opportunity to gain valuable leadership and teamwork skills and to develop their technical and competitive chops through participation in student groups, societies, and competitive teams that are affiliated with our department. 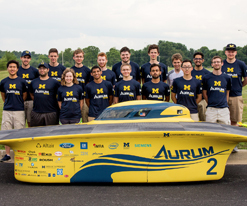 Computer science and computer engineering play critical roles on high visibility teams such as the Solar Car team, UM:Autonomy, and the competitive Michigan Data Science team. In an increasingly competitive job market, our programs offer students excellent options for a secure future. Job and internship opportunities are available through the Engineering Career Resource Center, whose annual report illustrates that students from our programs are amongst the most highly sought and best compensated by employers. 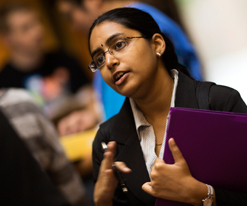 CS, CE, and DS students are amongst the most highly sought by employers. The CSE Division is located on the U-M North Campus in Ann Arbor, which is consistently rated one of the most desirable, livable cities in the U.S.
Our alumni – who include Turing Award winners Frances Allen, Edgar Codd, Stephen Cook, and Michael Stonebraker – are highly recognized for their contributions to the field. Many are helping to solve critical societal issues as international leaders for companies and agencies such as Apple, Google, Intel, Qualcomm, AMD, NASA, Ford, Lockheed Martin, Motorola, GE, IBM Research Labs, and Microsoft. Others are striking out on their own to build a strong Ann Arbor economy with fast-growing tech startups such as Duo Security, Clinc, and Deepfield, and have demonstrated sustained success at established local tech firms such as Arbor Networks and Menlo Innovations. Join this exclusive group as one of the leaders and inventors who are shaping and changing our world for the better!